Please refer to our stock # 39B14 7715 when inquiring. A diminutive English Regency period bracket clock with dial signed by Charles Leonard, Church St., Camberwell. Early 19th century. 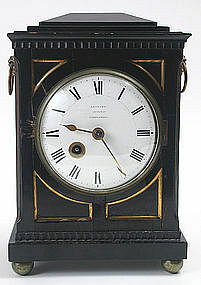 This clock is housed in an ebonized case with architectural details and with gilt brass molding to the inset front panels, pierced brass fish scale side panels with silk backing, a round 5" convex white porcelain dial with painted Roman numerals and with the name "LEONARD Church St. CAMBERWELL"; and is supported on 4 brass ball feet. There are two applied brass basket of grapes and ring carrying handles on either side of the case. The brass 8-day movement has an anchor escapement and single fusee time only drive. The clock is in running condition and is offered with its winding key and also with a key to the glass paneled rear door. Size: 11.5" ht. x 7.75" wide x 5" deep. Condition: a couple of fine hairlines around the winding arbor on the porcelain dial, some wear to the wooden case where the latch of the glass bezel makes contact with it, some cracks to the ebonized veneer, especially on the rear door, and minor warping to the base molding visible from the back of the clock; some scuffing to the veneer along the top cornice running along the left side. Several vacant holes in the backplate indicate that there has been some alteration to the movement. We have not examined the clock movement out of the case and are selling it in as-found condition. Charles Leonard is listed as working at the above address from 1826-1832.